Bay of Plenty’s Ben Townley is possibly one of the greatest motocross exports to come from the Land Of The Long White Cloud. New Zealand has produced some of the best off-road motorcycle riders the world has seen, with Josh Coppins, Shayne and Darryl King, Daryl Hurley, Darryl Atkins, Katherine Prumm, Courtney Duncan, Stefan Merriman, Chris Birch, Paul Whibley and now Liam Draper and Hamish Macdonald taking the dirt bike world by storm. 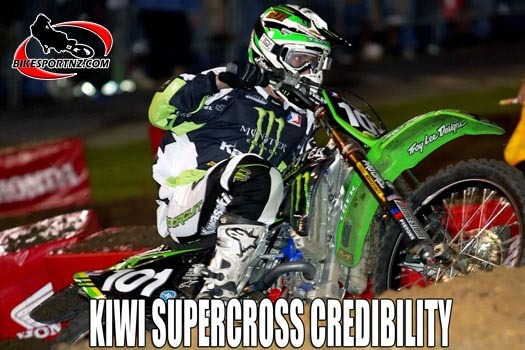 Townley, however, was the only Kiwi rider able to really master supercross. At the beginning of the 2007 250cc AMA Supercross season, Pro Circuit Kawasaki team-mate Ryan Villopoto was on a tear during the Western Conference portion of the championship – eventually claiming six out of seven race wins on the predominantly Californian Coast en route to the championship. Villopoto’s success was somewhat predictable, with the 18-year-old having claimed third overall in his rookie season, along with clinching the 2006 AMA Motocross Championship on debut in the 250 Class. When the West was all but won, the series shifted to the East Coast, which was viewed as one of the most wide open championships the series had potentially seen up until that point. In the mix was Suzuki’s Ryan Dungey, who was making his professional supercross debut having competed in select outdoor national rounds the season prior following his graduation from Loretta Lynn’s. Also in there was 2003 AMA East Coast Supercross Champion, Brandon Jesseman, whose career had hit a slump since his title. Townley also lined up, sitting aboard a Mitch Payton-tuned Pro Circuit Kawasaki KX250F – a motorcycle and team Townley identifies as the best he’d been a part of in his career. “I’d ridden Kawasaki’s right throughout my career in New Zealand before I headed to Europe, so for me that was a pretty natural transition. Also riding for Mitch, at that point in time, you knew that you were on the best machinery, so I felt confident heading in,” reflects Townley. The season opener began well, with Townley fighting for the lead early and briefly making the pass for the top spot on Mike Alessi. The success was short lived, as the New Zealander ended up dropping right the way back to the final place in the main event, and Dungey took his first career win. Throughout the six rounds that followed, Townley captured three race wins along with five podiums to capture the 2007 East Coast Supercross crown – three points clear of second place Ryan Morais. “That was a crazy championship – for it to come down to the wire – and really to be realizing my dreams as a racer was just unreal. We then moved into outdoors and RV (Ryan Villopoto) and I went at it all summer long, and he eventually won. Ryan was better that season, but I stayed in it, grinding away and nearly came away with the outdoor championship – 2007 was just an awesome year,” commented Townley. The New Zealander’s career ended up being stunted by injuries from then, as he’d signed to compete with the Factory Honda team from the 2008 season onwards. Injuries plagued the next few years, with Townley eventually returning to his homeland and competing in cameo appearances during the Australian MX Nationals Championship, which ended in retirement in 2013. For the most part he remained inactive on the racing scene for the years that followed, until a phenomenal performance at the 2015 Motocross des Nations saw Townley nearly take a moto victory against then World Champion – Romain Febvre. Following that performance, he spent the next season apart of the Suzuki World MXGP Team, of which he landed a few strong results, however retired from World Competition once again at the conclusion of the year. Since the resurgence, Townley has been working with local racers in New Zealand, along with trying to kick-start supercross within the country – a prospect that may now be well and truly brought to fruition as the Monster Energy S-X Open is set to take off this Saturday evening. “This is massive on so many levels. As soon as Adam (Bailey, director of AUS-X Open) called and asked if I was interested in helping out, I was 100% on board. When I was growing up, supercross was quite big over here – we’d have a consistent four round championship most years, as well as four permanent tracks that we’d have access to. I believe that me racing those as a kid on 80’s, 125’s etc. was a large reason as to why I was able to hit the ground running in the USA,” reflects Townley. “So it’s massive in that the government have come on board to support the event, that’s huge to have their belief first and foremost. Then for the kids coming up you know, to have supercross ramping up again, it really gives these guys the opportunities and platform to make a career out of it overseas. Lastly, for motorsport fans in general in NZ – you know I was really nervous as to how ticket sales would go, but so far that’s really blown me away. So now it’s really just up to the weather gods – New Zealand isn’t green without any rain – but hopefully we don’t get too much and we can put on a good show,” said Townley. The 2018 S-X Open will mark the second and final round of the newly-created Monster Energy S-X Open International Supercross FIM Oceania Championship, which is an incredibly exciting prospect for the Southern Hemisphere in terms of supercross growth. Mount Smart Stadium will be the hosting venue for the clash, with riders such as Dean Wilson, Chad Reed, Justin Brayton, Brett Metcalfe and more set to clash for not only the round win, but the inaugural championship. Townley will also be in attendance and a part of the event, with the 2007 East Coast Champ set to be hovering around a supercross track once again.